Heat oven to 375°F. Spray 13x9-inch (3-quart) glass baking dish with cooking spray. In 10-inch skillet, cook beef and onion over medium-high heat, stirring frequently, until beef is thoroughly cooked; drain. Sprinkle with salt and pepper. Place rice and water in baking dish; stir to mix. 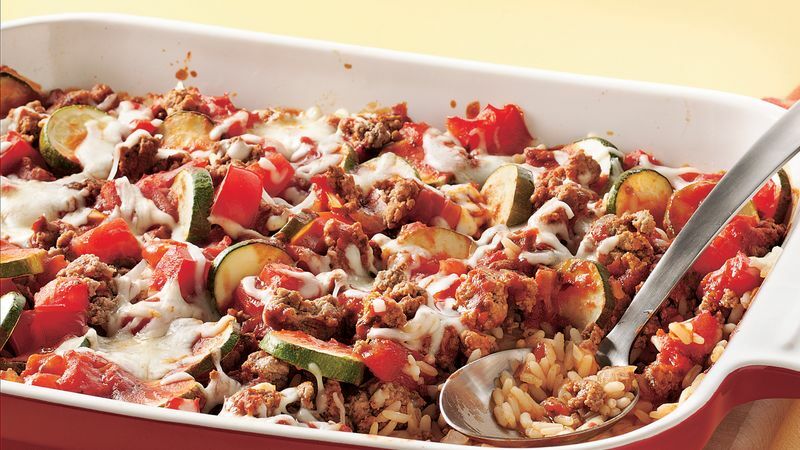 Layer cooked beef, zucchini and tomato over rice. Pour soup over top. Cut 16x12-inch sheet of foil; spray with cooking spray. Cover dish with foil, sprayed side down. Bake 40 minutes. Uncover dish; sprinkle cheese over top. Bake uncovered 10 to 15 minutes longer or until edges are bubbly and cheese is lightly browned. Use your garden-harvested zucchini in this hearty entrée. Large zucchini can be used if the slices are cut into quarters.